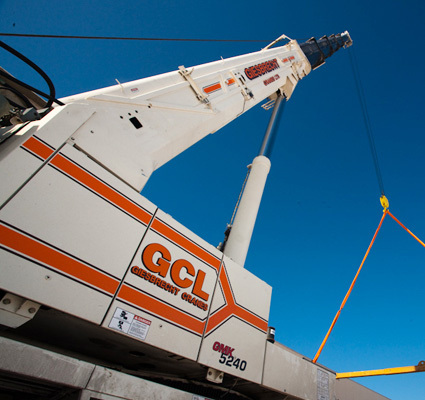 Giesbrecht Cranes uses the most advance equipment available in the industry. We have cranes for all needs, and of all sizes. Ranging in size from 8.5 Ton to 15 Ton Carry Deck Cranes. 25 Ton to 50 Ton Boom Trucks. 60 Ton to 90 Ton Hydraulic Mobile Cranes. 30 Ton to 90 Ton Rough Terrain Cranes. 120 Ton to 400 Ton All Terrain Cranes, and Conventional Cranes up to 440 Tons. There is no job too big or too small for us, as we have a maximum tip height reach of over 400 feet. Please give us a call to fulfill your hoisting needs. At GCL we believe that we exist to serve the customer, in a safe, serviceable and reliable way. We promise to provide the highest quality of personalized service to our customers and conduct all of our business in a professional manner. Our most valuable asset is our reputation.